Abscesses - body, contagious, causes, What Are Abscesses? Abscesses (AB-seh-sez) are localized or walled off accumulations of pus * caused by infection that can occur anywhere within the body. Furuncles (FYOOR-ung-kulz), which are also known as boils, and carbuncles (KAR-bung-kulz) are types of abscesses that involve hair follicles * and occur on the skin. An abscess develops when the body's immune system isolates an area of body tissue that has been infected by an invading microorganism * (usually bacteria) to prevent the infection from spreading further into the body. It does this by sending infection-fighting leukocytes (LOO-kuh-sites) to the infected area; leukocytes are specialized white blood cells that can destroy infectious microorganisms such as bacteria, parasites, and viruses. As the bacteria and white blood cells clash at the site of infection, pus begins to form within the involved tissue. 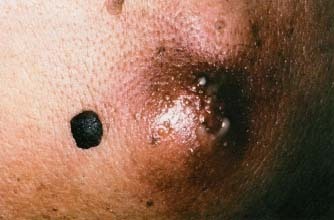 As the infection progresses, a wall of tissue develops surrounding the infection site, forming an abscess. A growing abscess on the skin is usually warm, red, painful, and swollen with pus. Abscesses that grow inside the body are rare in healthy people but can be very serious. Internal abscesses can occur anywhere within the body, but some of the more common areas where they form include the appendix * (as when someone has appendicitis, ah-pen-dih-SY-tis, an inflammation of the appendix), surrounding one of the tonsils * (a peri-tonsillar, per-ih-TON-sih-lar, abscess), and in the gums or jaw (a dental abscess). They may also form in the liver, spinal cord, or on or in the brain. People who have weak immune systems, such as those who need chemotherapy for cancer or someone with diseases such as longstanding diabetes or HIV/AIDS, are more at risk for developing internal abscesses. * hair follicles (FAH-lih-kuls) are the skin structures from which hair develops and grows. * appendix (ah-PEN-diks) is the narrow, finger-shaped organ that branches off the part of the large intestine in the lower right side of the abdomen. It has no known function. * tonsils are paired clusters of lymphatic tissue in the throat containing cells of the immune system that help protect the body from bacteria and viruses that enter through a person's nose or mouth. A carbuncle is a deep-seated infection of the skin and underlying tissue that typically forms in closely placed hair follicles. develop carbuncles than are women. Fever and a general feeling of illness are often associated with carbuncles. Bacteria that are commonly found on the skin, such as Staphylococcus aureus (stah-fih-lo-KAH-kus ARE-ree-us) and Group A, 3-hemolytic Streptococcus (he-muh-LIH-tik strep-tuh-KAH-kus) typically cause most abscesses, furuncles, and carbuncles. Much of the skin's surface is covered by hair. At the base of each hair is a hair follicle, a sac-like pit in which the hair shaft develops and grows. If the skin around a hair follicle has been damaged in some way, such as with a cut or a nick on the skin from shaving, bacteria on the skin's surface can enter and start to cause an infection. This alerts the body's immune system, which walls off the area around the infected hair follicle. As the body's defenses go to work, the area fills with pus and becomes inflamed. When an area of skin contains infected, inflamed hair follicles, the condition is known as folliculitis (fuh-lih-kyoo-LYE-tis). A boil usually starts out within an area of folliculitis. The growing pus inside the boil creates pressure and swelling around the infected spot, often forming a drainage point at the surface of the skin called a head. A carbuncle typically has many small areas where pus has collected and formed heads. Abscesses that appear inside the body, such as within the abdomen, may be caused by types of bacteria different than those that cause skin infections. For example, an abscess that forms with appendicitis may be caused by a blockage in the appendix (known as a stone). These abscesses usually contain bacteria normally found inside the intestine and in bowel movements. A liver abscess can occur when an infection in the abdomen spreads or when an infectious agent from somewhere else in the body travels through the bloodstream and is deposited in the liver. Abscesses are not contagious, but the bacteria that cause them can spread from person to person and can cause other types of infections. Anyone who touches a boil that is draining pus should wash their hands, and cloths or towels that have touched an open or draining boil or carbuncle should not be shared. How Are Abscesses Treated and Prevented? Skin abscesses sometimes need to be drained before they can heal, although most of the time they heal on their own without medical treatment. Skin abscesses are often treated at home by applying warm compresses. The abscess usually comes to a head on its own, then begins to drain and heals soon afterward. Boils and carbuncles that do not drain on their own should not be squeezed or lanced (cut open) to remove pus by anyone but a health care provider. Trying to puncture a boil at home could force the infection deeper into the skin or spread the bacteria. Skin abscesses that do not improve on their own need to be lanced by a doctor to prevent the infection from becoming worse. The area is then thoroughly cleaned, and antibiotics are sometimes prescribed. Most carbuncles require antibiotic treatment. Internal abscesses are usually treated with surgical drainage and antibiotics. If a dental abscess is not treated with antibiotics it can destroy the root of a tooth, leading to the need for a root canal * procedure or removal of the entire tooth. Keeping the area around a minor skin wound clean and dry, not sharing razors, and using antibacterial soap can help prevent skin abscesses. In the Bible, God tests the faith and devotion of Job by allowing him to become afflicted from head to toe with painful boils. Job syndrome is named for this biblical figure. People who have this rare disease experience recurring cases of severe abscesses on the skin and in the lungs, sinuses * , and bones. * sinuses (SY-nuh-ses) are hollow, air-filled cavities in the facial bones. Turkington, Carol, and Dover, Jeffrey, MD. Skin Deep: The Encyclopedia of Skin and Skin Disorders. New York, Facts on File, 2002. U.S. National Library of Medicine, 8600 Rockville Pike, Bethesda, MD 20894. The National Library of Medicine has a website packed with information on diseases and conditions (including abscesses), consumer resources, dictionaries and encyclopedias of medical terms, and directories of doctors and helpful organizations.